Jessop's Extraordinary Play Against South Africa. 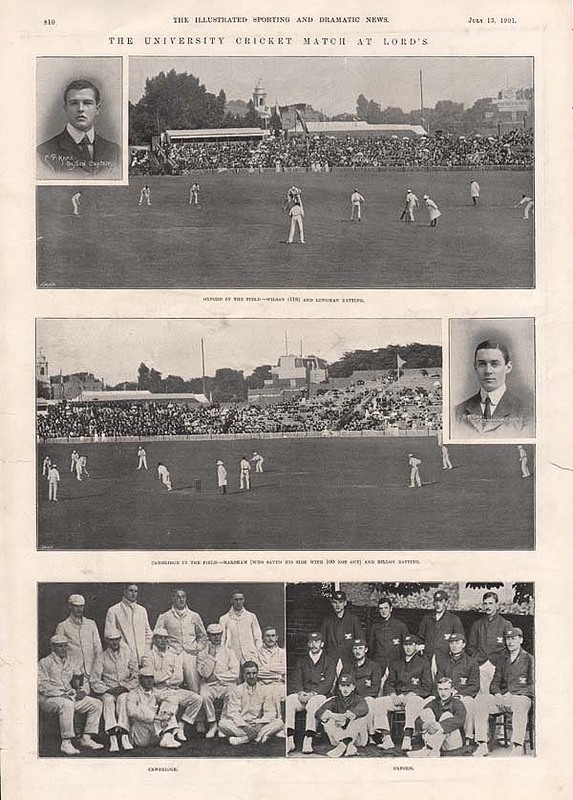 A full page from the Illustrated London News dated 6th July, 1907 carrying photographs of "Incidents at Lords on the first day of the match" between England and South Africa. One of the photographs shows Dr GRACE inspecting the wicket, another photo shows the two captains R.W. Sherwell S.A. and R.E. Foster. On the verso is a photograph of Mr Bonar Law M.P. 'The winner of the Parliamentary Golf Handicap'. Some Famous Living Cricketers - A Portrait Group. An antique woodcut engraving prepared for "The Graphic" news paper and published August 11th, 1883 with later hand colouring. A separate Key Block is included where each individual player is identified. An antique line engraving by H.A. Ogg after T. Henwood. 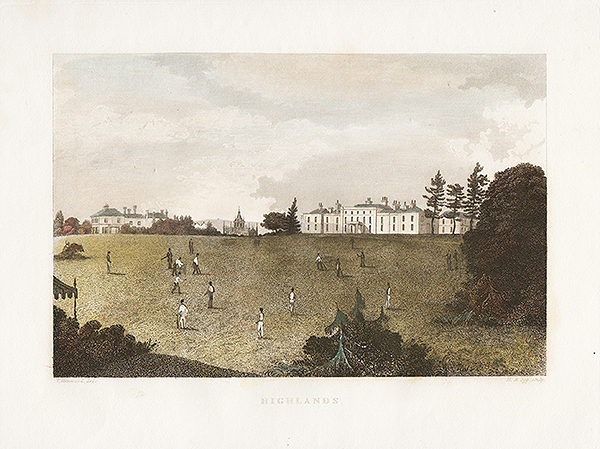 Publshed in 1835 with later hand colouring. Cricket match in progress. An antique print entitled "The Demon Bowler" produced for the famous Victorian Magazine "Vanity Fair" founded by Thomas Gibson Bowles which commenced publication in 1869. For about forty five years caricatures of famous and infamous personalities were carried in the weekly issues of Vanity Fair. Subjects included Royalty, judges, politicians, musicians, sportsmen, artists, actors and criminals of Victorian and Edwardian Britain. This print by 'Spy' was published July 13th, 1878. Mr. Samuel Moses Jones Woods. 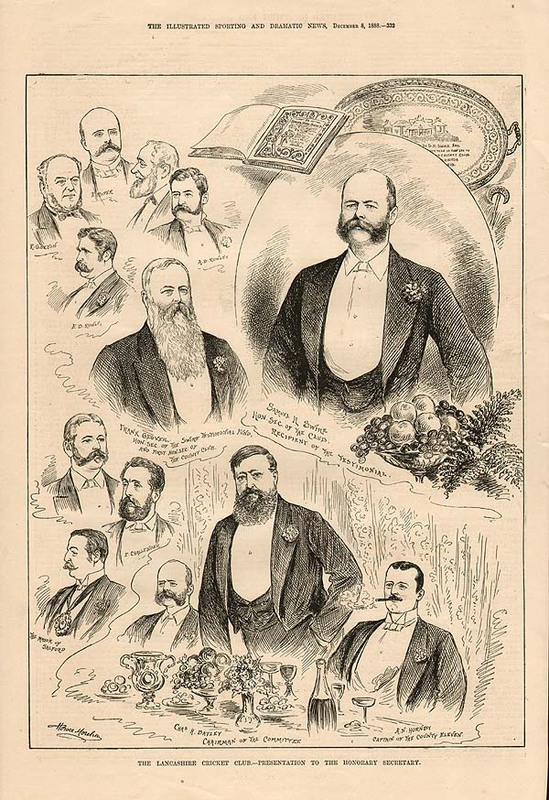 An antique print entitled "Sammy" produced for the famous Victorian Magazine "Vanity Fair" founded by Thomas Gibson Bowles which commenced publication in 1869. For about forty five years caricatures of famous and infamous personalities were carried in the weekly issues of Vanity Fair. Subjects included Royalty, judges, politicians, musicians, sportsmen, artists, actors and criminals of Victorian and Edwardian Britain. This print by 'Stuff' was published on 6th August, 1892. 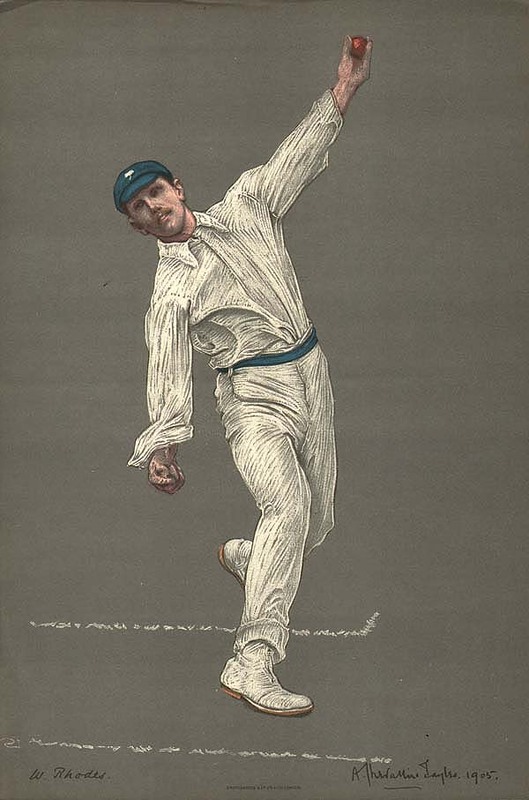 An antique print entitled "Cricket" produced for the famous Victorian Magazine "Vanity Fair" founded by Thomas Gibson Bowles which commenced publication in 1869. For about forty five years caricatures of famous and infamous personalities were carried in the weekly issues of Vanity Fair. Subjects included Royalty, judges, politicians, musicians, sportsmen, artists, actors and criminals of Victorian and Edwardian Britain. This print by 'Spy' was published June 9th, 1877 . The Lancashire Cricket Club - Presentation to the Honorary Secretary. An antique woodcut engraving which was published in "The Illustrated Sporting and Dramatic News" on December 8th, 1888. Short report included in the text on verso, of the presentation to Mr. Samuel H. Swire. 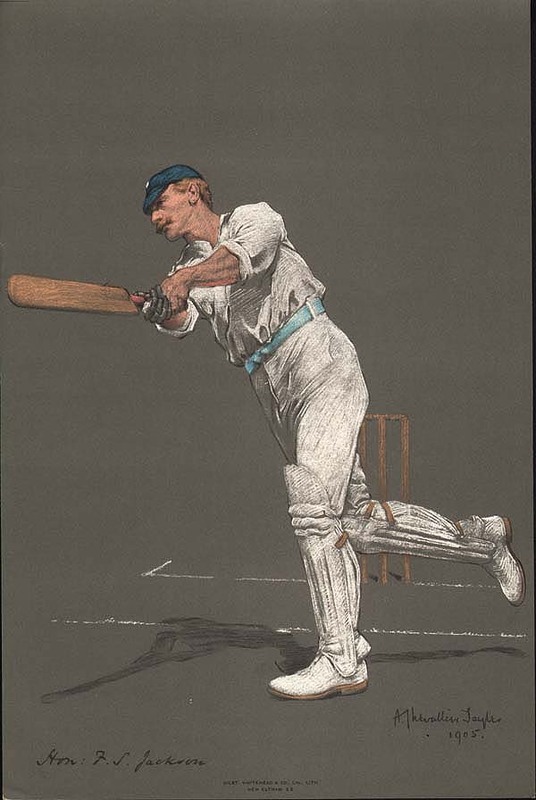 This colour printed chromolithograph is from "Laws of Cricket" by Charles CROMBIE published by Perrier Ltd. in 1907. The innings shall commence, after the ground has been swept and rolled unless the In - Side object. The bowler may make the batman (at the end from which he is bowling) stand on any side of the wicket which he may decide. When (in the opinion of the Umpire) six balls have been bowled he shall call "Over". 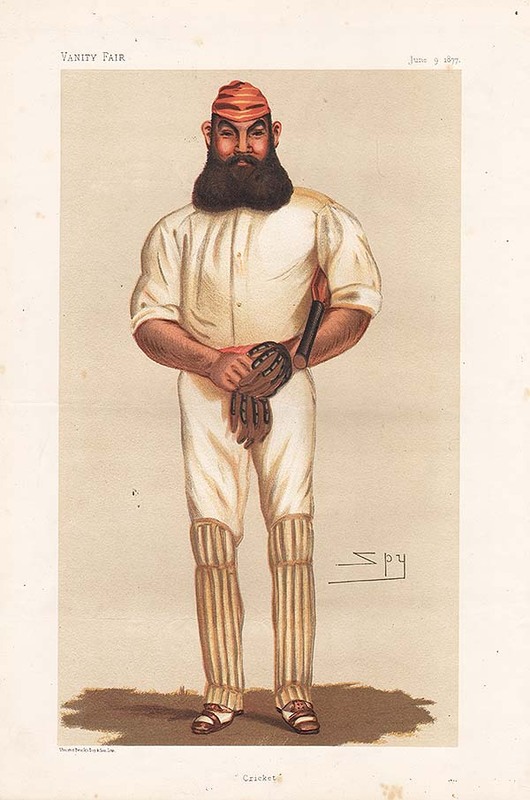 One of a series of colour lithographic portraits of cricketers on heavy grey paper, after drawings by A. Chevallier Tayler, each with a biographical sketch by G.W. Beldam printed on tissue paper. Mr G.W. 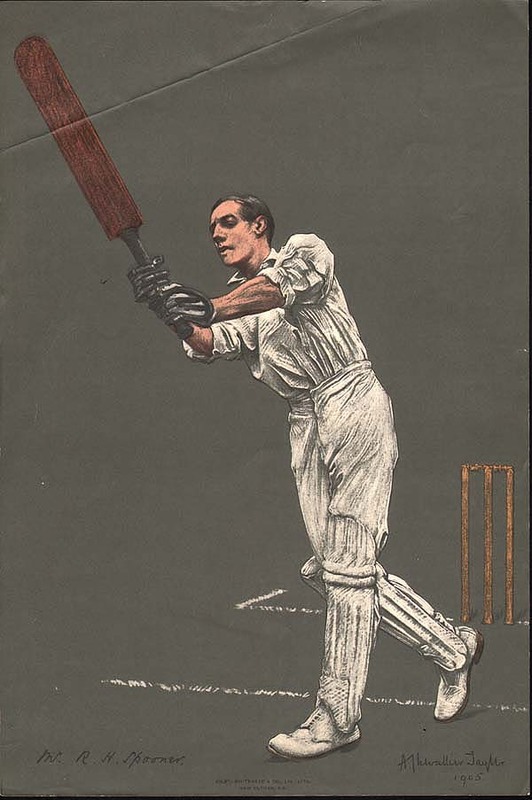 Beldam, "of the Middlesex Eleven, well known as an author, an artist, and a first-class cricketer". 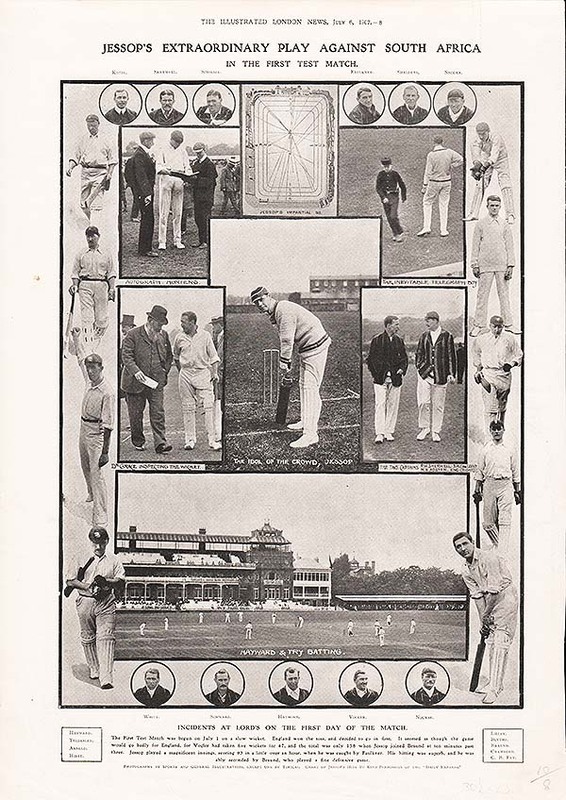 Published in 'The Empire's Cricketers, 1905' for the Fine Art Society by Dawbarn & Ward, London. . The prints were lithographed by Spottiswoode & Co, London.Sharp crease in top left corner. The Hon. Francis Stanley Jackson. Yorkshire - Finishing Off-drive. 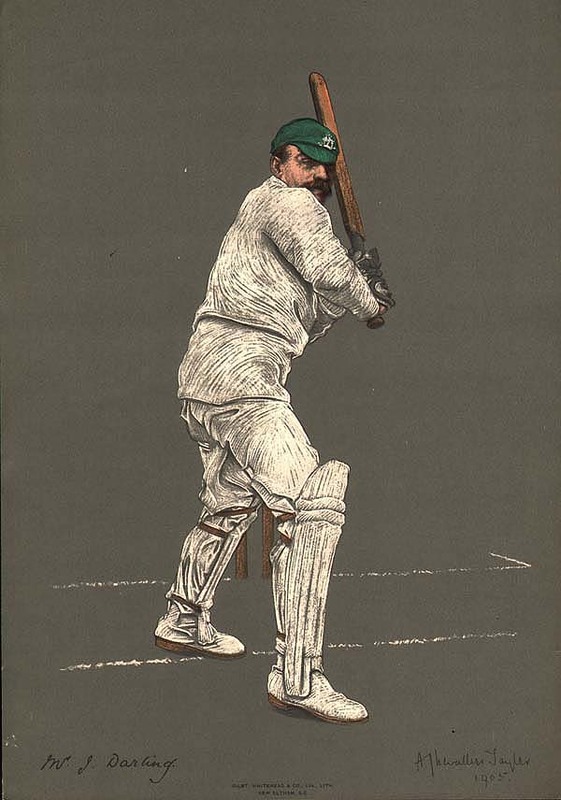 One of a series of colour lithographic portraits of cricketers on heavy grey paper, after drawings by A. Chevallier Tayler, each with a biographical sketch by G.W. Beldam printed on tissue paper. Mr G.W. Beldam, "of the Middlesex Eleven, well known as an author, an artist, and a first-class cricketer". 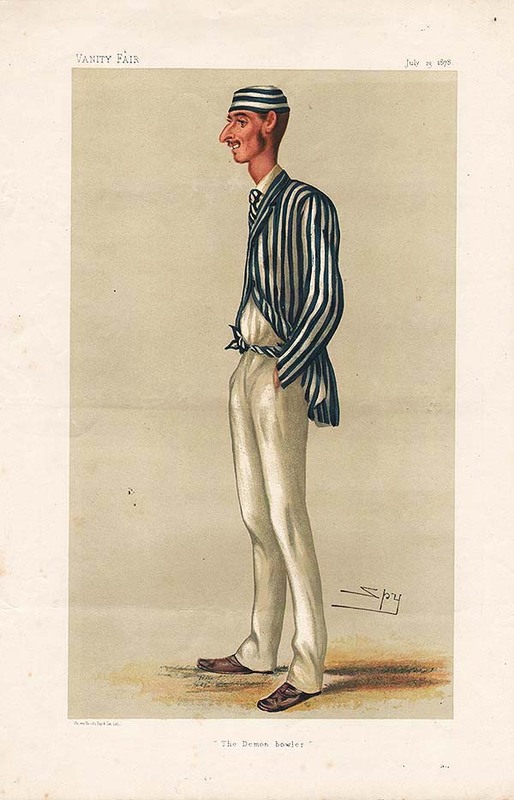 Published in 'The Empire's Cricketers, 1905' for the Fine Art Society by Dawbarn & Ward, London. . The prints were lithographed by Spottiswoode & Co, London. Mr. Arthur Owen Jones. Notts - On-side Push. Mr. Reginald H. Spooner. Lancashire - Finish of Off-drive along the Ground. Mr. J. Darling. Captain of the Australian XI - Stepping out to drive. 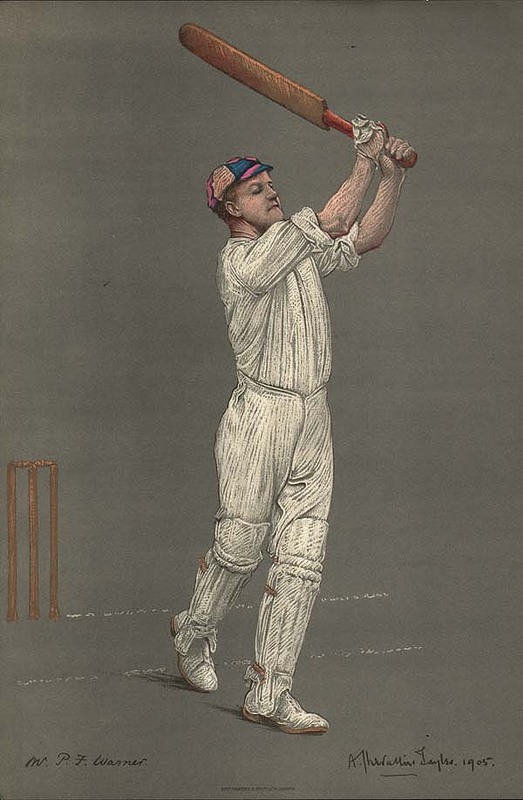 Mr. Pelham F. Warner, Middlesex - Finish of On-drive. Wilfred Rhodes, Yorkshire - About to deliver. Mr. Gregor McGregor, Middlesex - About to take a ball on the leg side. The University Cricket Match at Lords. A page from "The Illustrated Sporting and Dramatic News" published on July 13th, 1901. The Oxford Captain was F.P. Knox and the Cambridge Captain was S.M. Day. Some old marginal tears not affecting the image. A rare print after Henry Coller (1886 - 1958) This was published in an early 20th century magazine circa 1928 - 1930. Henry Coller was a commercial artist and illustrator who prepared the artwork for five series of cigarette cards between 1928 and 1934. His entry in "Who's Who in Art" (6th edition) mentions sports sketches and drawings of sportsmen. This print is one of a collection of prints from a scrap book compiled in 1930. W.G. Grace and Thomas Hayward. An article entitled "Chronicles of Cricket - Changes in the World-Fames Game" which appeared in "The Shere" on July 14th, 1900. It includes two photographs of W.G. Grace and Thomas Hayward. A double-page woodcut engraving entitled "SOME REPRESENTATIVE CRICKETERS". Published in "The Graphic" newspaper on July, 12th, 1890. 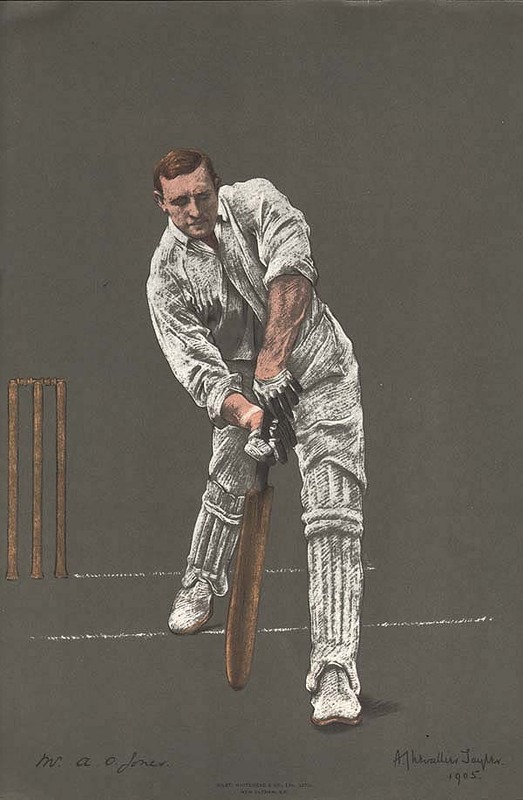 Cricketers include W.G.Grace, Lord Harris and W.W.Read. 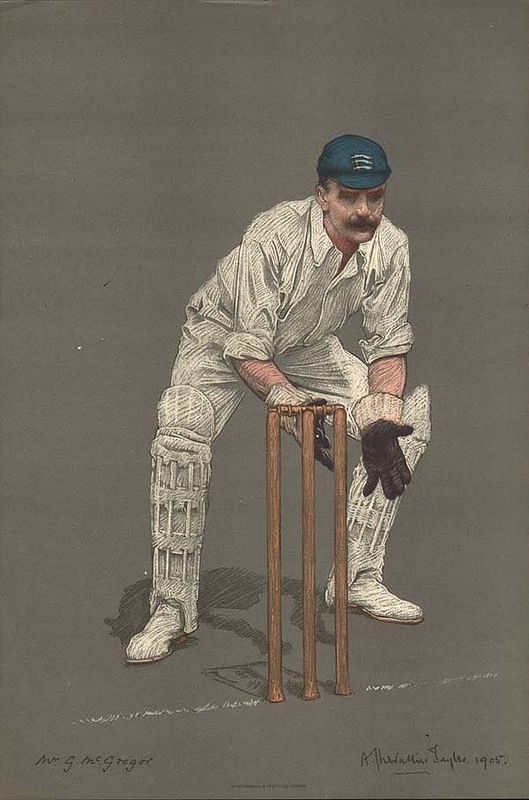 Cricket at Lord's - "Eton and Harrow"
An engraving prepared for the front page "The Illustrated Sporting and Dramatic News" newspaper published, July 21st, 1877. Later coloured by hand. Repaired tear in bottom left corner of printed area. No paper loss. 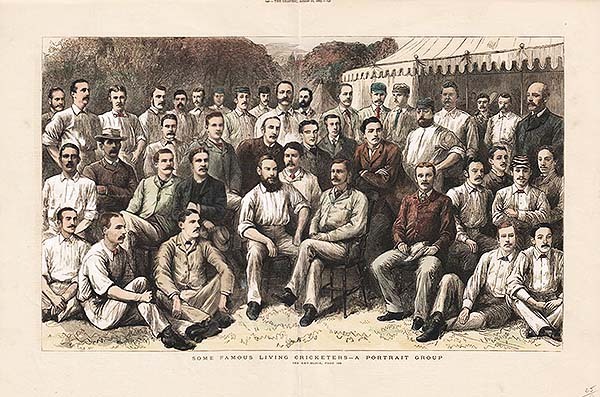 Cricket - Oxford and Cambridge at Lord's July 4, 5 and 6 1901. A woodcut engraving by R. Cleaver published in "The Illustrated London News" on 13th July, 1901 with later hand colouring. References are made to E.R. Wilson and F.P. Knox who were participants in the game.